What a way to start the week with the latest release from one of our favourite labels at NOYZ – Trapez. In our opinion Trapez are one of the most consistent labels around, Always pushing new and exciting talent whilst managing to keep the quality at the highest level. The label has a real identifiable sound and has carved out its own place in the underground which is very difficult in a world where running a label is accessible to all. In case you missed them check out two other recent releases on the label that we have supported from our good friend Arjun Vagale and also this awesome E.P that we posted about from Italian producer Nick Olivetti. 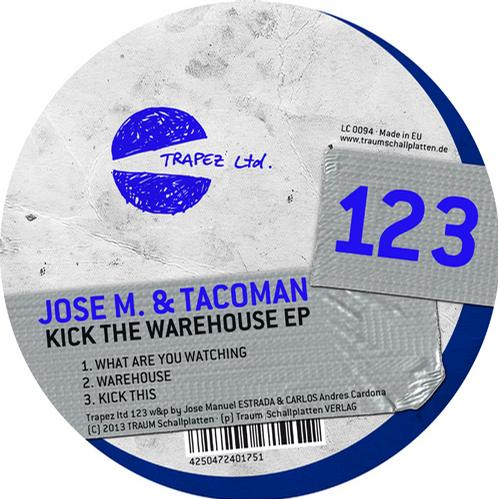 This latest E.P from Jose M. & Tacoman has all the usual Trapez ingredients, heavy drums, a ferocious low end and most importantly plenty of groove. We have been keeping our eye on these two Columbian producers for a while now. As described in their biography, Jazz, Funk and Soul are their guns to flood the dance floor. They definitely live up to this statement. We see a bright future ahead for these guys! The E.P consists of 3 tracks titled “What Are You Watching”, “Warehouse” and “Kick This”. It’s a solid affair all round so we thought it was only right to give you a taste of all 3 tracks. As always please support and share the music!